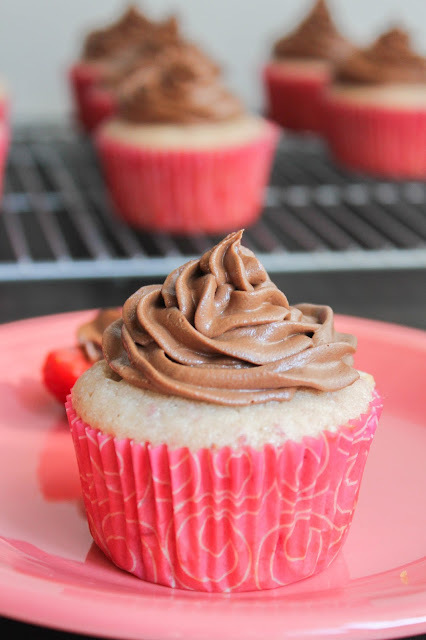 These Fresh Strawberry Cupcakes with Milk Chocolate Hazelnut Frosting are the perfect summer treat! whipped to perfection. What could be better? I'm a huge peanut butter lover and Peanut Butter & Co. is my absolute favorite brand. With varieties like White Chocolate Wonderful, Cinnamon Raisin Swirl, and Mighty Maple, I'm sure you understand why. You can only imagine my excitement when I heard about their new product, Chocmeister, a delicious chocolaty hazelnut spread. 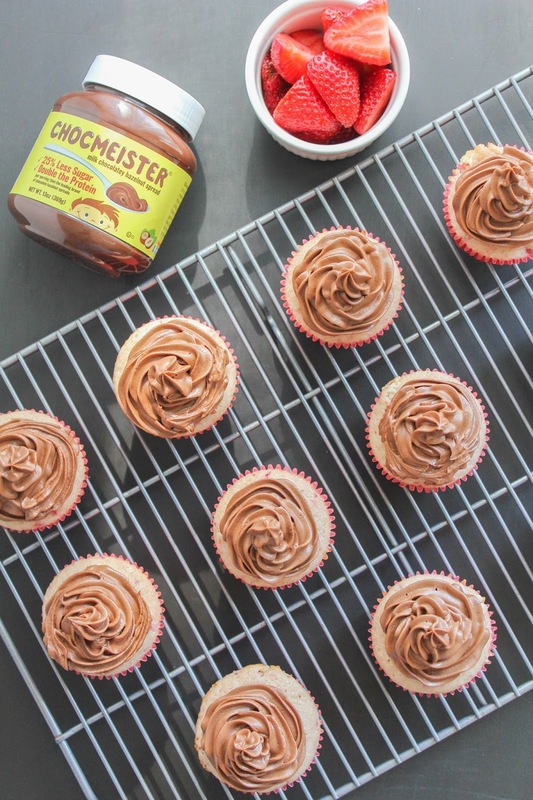 Chocmeister is made with 25% less sugar and more protein than the leading brand of chocolate hazelnut spreads. I recently got my hands on a jar of the Chocmeister Milk Chocolatey Hazelnut Spread and haven't looked back! This spread is fabulous on toast, spooned over ice cream, and on fruit. Lately I've been adding a little dollop to my strawberries for an afternoon snack! As a member of the Peanut Butter & Co. Yum Squad, I was tasked with creating a fun recipe to share with you all. Since I'm a passionate baker, I knew I wanted to make a delicious dessert, which is exactly what I did. These Fresh Strawberry Cupcakes with Milk Chocolate Hazelnut Frosting are the perfect summer treat. 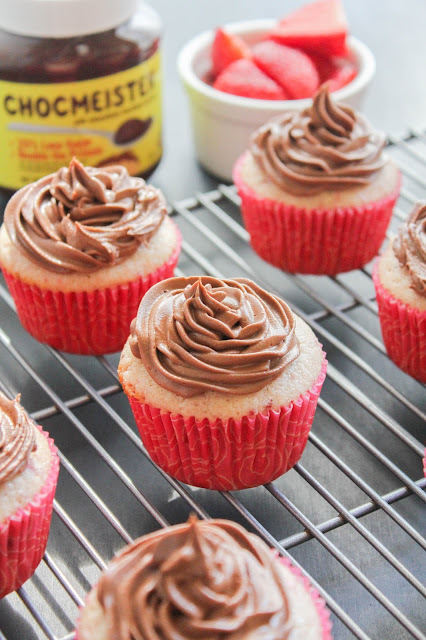 Light and airy cupcakes filled with so much strawberry flavor, then topped with a milk chocolate hazelnut frosting that's whipped to perfection. It really is the perfect dessert after any meal. One of these cupcakes would even be good with a cup of coffee for breakfast! Not that I would know or anything, I'm just sayin'. Be sure to visit the Peanut Butter & Co. website to learn about all the awesome products they have. You can also enjoy $1 off any jar of Chocmeister by using code chocolatey through July 31, 2016! Be sure to follow them on Facebook, Twitter, Instagram and Pinterest to read about new promotions and find recipes that they share. Now, who's ready to make some cupcakes? Preheat the oven to 350 degrees. Line a 12-cup muffin tin with cupcake liners and set aside. In a bowl, whisk together the flour, baking powder, and salt. In the bowl of a stand mixer, beat the butter and sugar until light and fluffy. Add the eggs, one at a time, beating well after each addition. Add in the vanilla, milk, and strawberry puree and mix until combined. Slowly add the dry ingredients to the mixer in batches, just until combined. Fill the prepared pan with the batter, filling each well about 3/4 full. 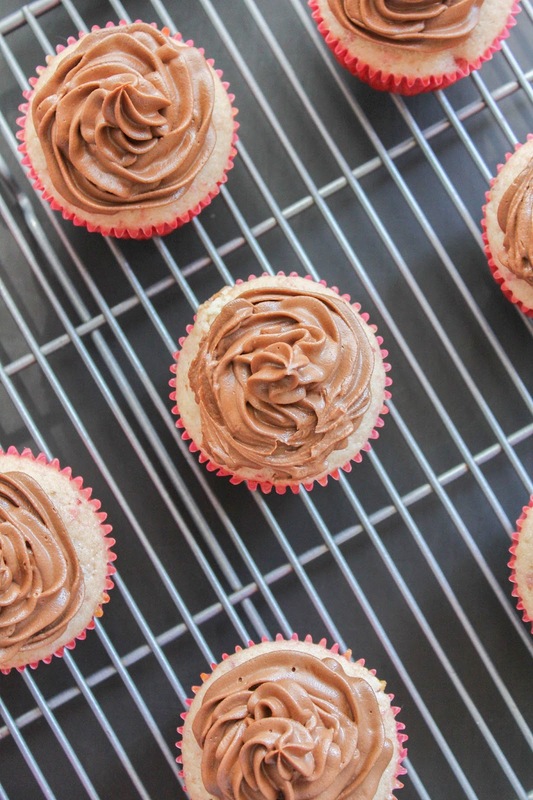 Bake for 20-25 minutes, or until the tops of the cupcakes bounce back when lightly touched. Place the cupcakes on a wire rack to cool completely before frosting. To make the frosting, add the butter to the bowl of a stand mixer. Beat until smooth and creamy, about 2 minutes. Add the powdered sugar and salt, then the Chocmeister spread. Add the milk and vanilla and beat on high until smooth. If the frosting is too thick, add another tablespoon of milk. Frost the cupcakes as desired. As a member of the Peanut Butter & Co. Yum Squad, I received product in exchange for this post. All opinions, as always, are my own.